Kindle for the Web has been around for almost a year and it seemed as it wasn’t going anywhere at all. Seemingly nothing happened even when Google came out with their online eBook offering. Then some more time passed and Apple started pressing eReader apps into selling eBooks via Apple app store. This would mean 30% commission for Apple but it would also cause eBook sellers like B&N, Sony and Amazon to loose (even more) money on eBook sales. Moving to the web seemed like a logical choice. Eventually Apple backed out and thing returned to status quo. However a few days ago Kindle did significantly expand their Web presence by releasing Kindle Cloud Reader (https://read.amazon.com/). Kindle is now safe from Apple app store assaults since using the web application is a viable option. Apple blocking or otherwise preventing users from using the web application will open doors to so much legal and PR trouble that even billions of the cash that Apple stashed so far might not be enough to get them out of it. However as we’ve already seen, Apple wouldn’t go as far as removing a popular eReader apps from their app store anyway since it would accomplish nothing and hurt everyone (including Apple). The fact that Kindle Cloud Reader comes with book store “optimized for tablets” it seems very likely to me that one of the original goals behind the project was to bypass Apple app store if need be. Chromebook users can now access Kindle eBooks. Nice, but given their current market share you can’t call this anything but future investment and hedging the risks of the emerging tablet market. While all platforms (except Linux and Chromebook) had official support for Kindle via apps it is nice to have the option to forgo app installation altogether. I’ve worked in the software industry for about 15 years already and my strong belief is that every application or feature is a bug waiting to happen. This is especially true in modern fast paced “release early, release often” environment in which even my TV and receiver want a firmware update (that always includes bug fixes) on a monthly basis (not to mention all apps that I have installed on either iPad or Android. So having fewer apps is better. So far browser has been the best way of isolating apps from the OS and from one another. 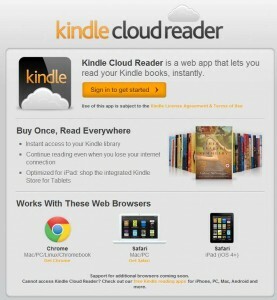 Kindle Cloud Reader will fully match what Google Books has to offer once all popular browsers are supported. However it’s not like Google Books is currently a serious player in the eBook market anyway. Another benefit of not having an app is the fact that it is easier for users to get their foot into the Kindle door since you don’t even need to install an app (never mind having a Kindle device as was the case a few years back) to start reading. Instant gratification is only one click away… However Amazon Cloud Reader is not fully integrated into Amazon Kindle Store yet. Although there is “Read now in Kindle Cloud Reader” button on the thank you page after the purchase, that button is nowhere to be found on the book product page. More importantly browsers that hold the largest market share (Internet Explorer, Firefox) on the most popular operating system (Windows) are not supported! 80% of users are left out. This may be the reason for the lack of book store integration. Users are more likely to install eBook reading app than a new browser and change their year old habits. Text-to-speech is not there. Given how complex the HTML document structure is (iframes within iframes and a lot of nested tags) I’m not sure if screen reader software will be able to handle it. There is only so much DRM one can put into browser app. With offline storage, pirating Kindle books would become a breeze. However it’s not like it wasn’t done before. Kindle DRM was broken in the past and even if it wasn’t there plenty of books circulating in torrents and shady websites anyway. You can find most of the books you would want with minimal effort. So not pirating is a conscious choice based on good nature and availability of legitimate purchase options rather than result of DRM. Although it may seem that I’m overall critical and negative towards Kindle Cloud Reader, I’m not. For all it’s current shortcomings it has a great potential and these shortcomings can be easily overcome. Developing web apps is cheap if you have the right infrastructure (which Amazon certainly does) so Amazon can add all of the missing features even if there will be little demand for the Cloud Reader. They will do it just because they can or “just in case”. Well written AJAX web application is truly cross-platform: I’ve seen the same app run on all Windows browsers, Mac browsers, iPhone/iPad/iPod Touch, Windows Phone 7, all kinds of Android devices, Linux, and even Kindle 3 browser. Not being bound by acceptance gates by numerous isolated app stores – that’s true freedom. Web app that doesn’t need to be installed and opens with a single click is also the ultimate instant gratification that will help many users get their first taste of Kindle. All in all Kindle Cloud Reader is mostly about potential now. Whether this potential will be fully realized is up to Amazon.